From concert tickets to free food, gift certificates to t-shirts and CD’s, wait until you see all the cool stuff you can win this semester from 107.7 The Bronc. Launch-A-Bronc is back for another season. Play Launch-A-Bronc at all Rider Men’s and Women’s basketball games to win great prizes, raise money and awareness on-campus for Relay For Life and American Cancer Society. Details are coming soon about this year’s contest and all the cool prizes you can win. Click here for more information about this year’s Launch-A-Bronc and the cool prizes you could win. The Bronc’s got a brand new way to win amazing prizes with The Bronc Plinko. Look for our plinko board at select on and off-campus events with incredible prizes. 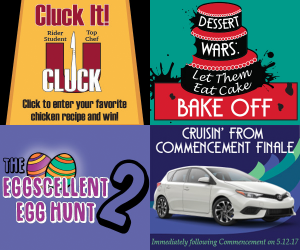 Two popular contests The Bronc hosts every year are Rider Student Top Chef and Dessert Wars. These are student cooking competitions where students submit recipes and the best 3 will present them to students, faculty, and a panel of judges to determine the best chef of the competition. The themes of Fall 2016 and Spring 2017 were Rider Student Top Chef: Cluck-U and Dessert Wars: Let Them Eat Cake. 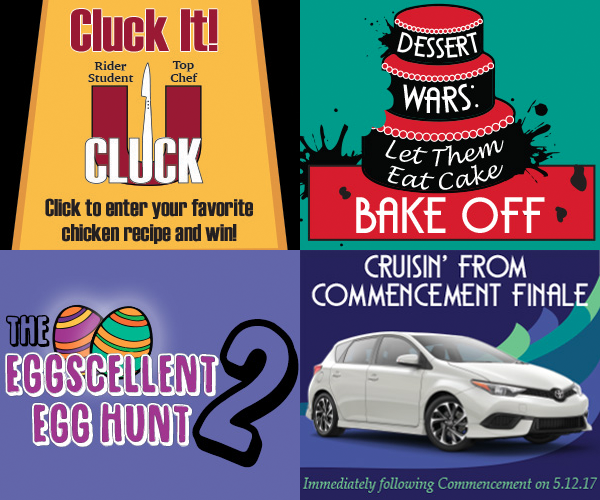 The Bronc has also expanded the scope of their contests with new events like The Eggscellent Egg Hunt and Cruisin’ From Commencement. During the Egg Hunt, the Campus Mall is covered by 8,000 eggs, with 1,000 prizes to grab, with the ultimate prize being a 3 or 4-night Royal Caribbean Cruise to The Bahamas for two, courtesy of Vacations by Stacy! As for the Commencement Contest, graduating Seniors submitted brief videos about their experiences at Rider University. The winner of that contest received a 2017 Toyota iM from Team Toyota of Princeton and a Royal Caribbean Cruise for two to the Caribbean! Keep listening to The Bronc for details. Like us on Facebook, follow us on Twitter, follow us on Instagram and for secrets on how you can win these and more great contests and prizes! !